What to look for when buying a portable camping shower? What are the types of portable shower kits available? Wash the Dirt Away, Wherever You Are! Camping can be a whole lot of fun. The whole rustic-vibe, sleeping under the stars in a canvas tent, and disconnecting from the modern world side of camping. We love it. We also love the making a fire, getting back to nature and eating a ton of smores in front of that open fire we just made with a few friends and even more brewskies. If that’s all that was involved in camping, then, it’d be even more popular than it is. However, what puts many people off, is the fact that getting back in touch with nature and saying goodbye to our modern lives of comfort and convenience, comes at a cost – looking and feeling like a hobo after only a few days. Although many camping lovers will say it’s all part of ‘the experience’, there’s a lot that’d rather just book a few nights in a Hilton and visit a national park for a day. You can, though, enjoy the great outdoors while keeping yourself clean with the addition of a portable shower to your camping supplies. What you’ll find as soon as you start any search for camping showers is that there’s probably more out there than you expected. The choice, you see, comes down to how luxurious you want your camping shower experience to be. Filling a bucket up with some fresh lake water could be classed as a shower, but we’re not convinced that that would be anyone’s kettle of fish. Even if you got a bottle of water and poke a small hole in the lid, that could be classed as a shower, in a sense. That’s why we’re going to discuss some of the best camping shower options available right now. Let’s check them out now! This awesome piece of kit is ideal if you’re just looking for a simple solution to washing in the lake. 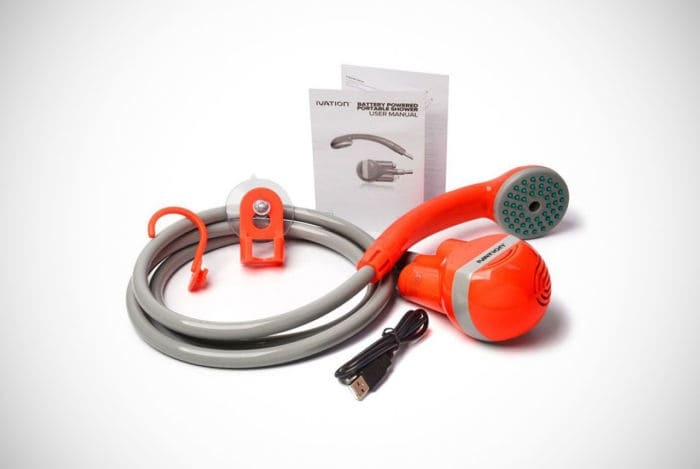 The Ivation portable outdoor battery-operated shower is not one of the most popular on the market for no good reason. Remember when we mentioned using a bucket of water as a camping shower? Well with this Ivation battery-operated handheld shower you can transform a bucket or even a sink into an effective shower. 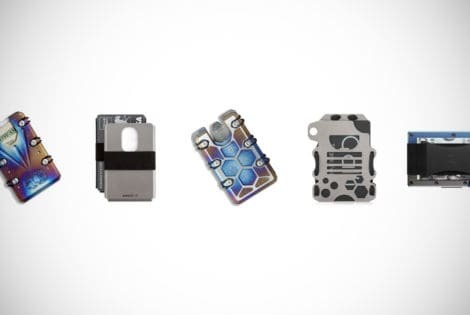 This portable and handy device comes with a simple showerhead, a pump and a lithium-ion 2200mAh rechargeable battery with a plug that can connect to a USB port or wall socket. So, is it really that simple? Yes, you just place the pump into any body of water, like a sink or bucket or some other kind of container. Then you’re ready to have that refreshing wash. The amount of shower time you have depends on how much water you use. For example, 2.5-gallons will give you 7 to 8-minutes, while 5-gallons will give you a rather luxurious 10-minutes. It really is that simple. What’s more impressive about this seemingly insignificant and minimalist accessory is what it comes with. You get, in addition to the showerhead, a flexible hose of 5.9-feet in length along with a S-shaped hanging hook and suction cup holder. 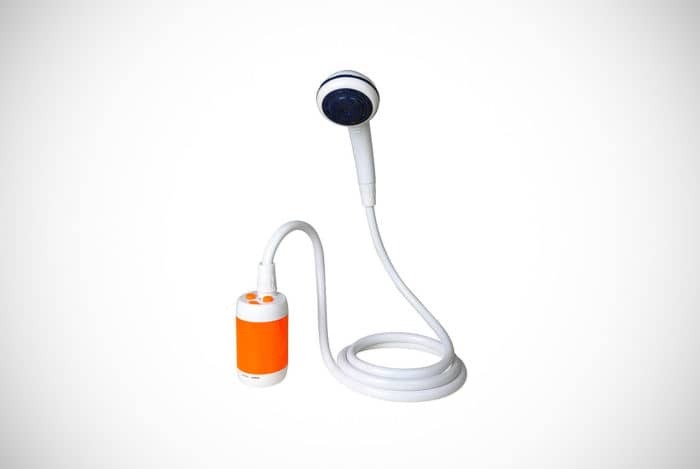 This means that with the pump in water you can hang the showerhead on just about anything, whether it’s a car window or even a tree, for hands-free showering. Next, we have a great option for anyone looking for a green solution to showering outside. The Advanced Elements portable shower is powered by solar power. This is possible because of its 4-ply vinyl construction that consists of the water reservoir, an insulator panel, reflector panel and solar panel. It’s the perfect way to enjoy a nice hot spray of water when you need to get clean at camp or wherever you may be. In addition to the main bag, you also get a showerhead that has an on and off switch. Filling the bag is easy thanks to the XL valve and twist-off cap. You then just need to leave for a short time with the clear side up for the solar panel to heat the bag of water up. In addition to the bag and showerhead, there’s also Velcro strapping for attaching wash cloths, a temperature gauge for the water, as well as a shampoo and soap side pocket. 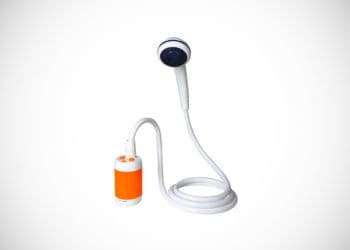 For such a small and compact device, and a weight of just 1.4-ounces, this Ivation portable shower sure packs a decent punch in the water spray department. It helps that it has an incredibly affordable price too! 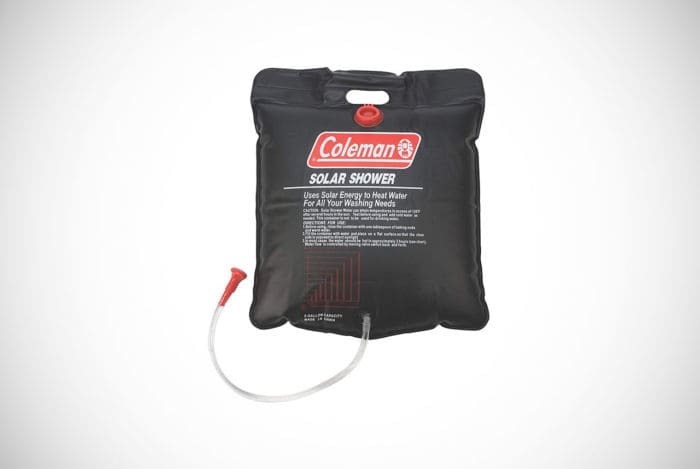 Coleman have utilized a similar design and layout to their 5-gallon solar shower as Advanced Elements. The bonus with this is that it’s a fraction of the above device’s price. You still get the benefit of a full 5-gallon container and a similar solar paneling system that warms the water up in no time at all. There’s also a reliably tough handle for easy carrying, but it can also be used to hang the bag just about anywhere. So, really if you’re choice was between this and the above one, you’d want to consider the price and whether you’re more of a Coleman or Advanced Elements fan. 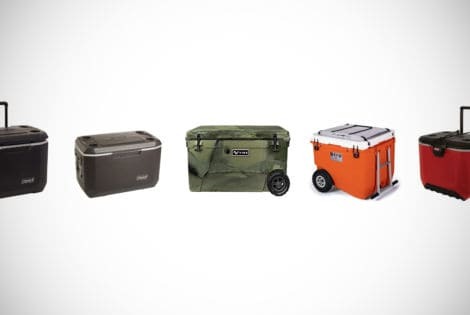 We love Coleman products here at Men’s Gear and have featured them many times before in various buying guides. 5-gallons is also more than enough for not just you to have a shower, but whoever you’re travelling or camping out with. If we had to change anything, it would be to include a larger showerhead, but that’s us just being picky. Don’t be surprised that the next portable shower in our guide, this great option from Risepro, has a similar design to the two directly above it. Most portable showers follow this kind of design and construction, because it has proved to be effective in the past. The bag itself is constructed from highly durable and environmentally-friendly PVC and the solar technology used means that it takes just a few hours to heat the water up to 45-degrees Celsius. In addition to the shower bag itself, you also get a hose and switchable showerhead for a more authentic experience that’ll remind you of being back home. With the hanging strap, you can hook the bag just about anywhere to free up your hands and to really get the benefit from using the shower. 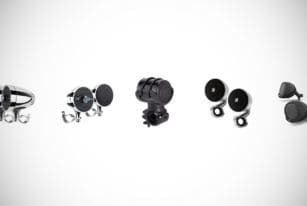 Like many other models, its incredibly easy to use and can be turned on or off, as well as from low to high pressure, at the touch of a couple of switches. Many other models don’t have quite as large a capacity and are excellent for when you want to keep your luggage light. However, if you favor a powerful shower experience that more than one of you can benefit from every full bag, this is a great option. The RinseKit PLUS is a little different from the portable outdoor showers we’ve featured so far. How so? Well, it offers the same kind of pressure you’d expect from a garden hose. Without the need for batteries or pumping. It was originally designed to give surfers an easy and convenient way to rinse off their wetsuits and surfboards before putting everything into the car and heading home. As the brainchild of the company’s founder Chris Crawford, this became incredibly popular and now is used for a whole host of scenarios. It’s also rather simple and easy to use thanks to its design and the quick connect feature. You can even use it with a sink or hose, if suitable. It takes less than a minute to fill up its 2-gallon tank and then you’re able to have a continuous high-powered shower experience for as much as 6-minutes. Tank pressure is retained for a maximum of one month. 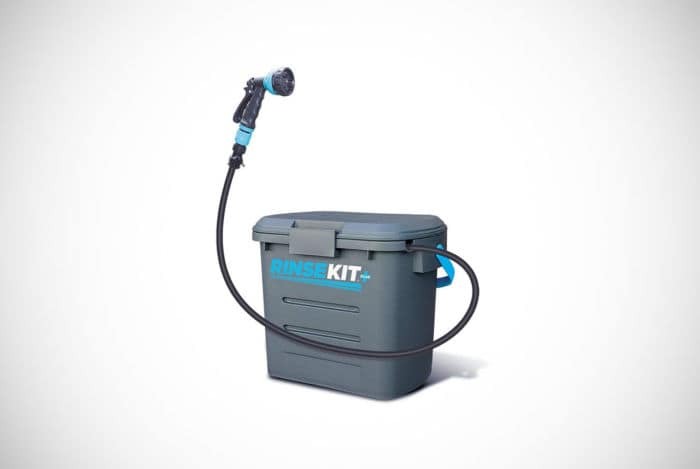 We really like the RinseKit PLUS and we have a feeling you will too. With it, you get everything you need to turn this bucket into a shower, with a 6-inch hose, a hose nozzle with a nice spray of water, hose bib adaptor, quick connect, hot water sink adaptor, on/off valve. There’s even some storage space within the top section of the RinseKit PLUS, for you to keep personal belongings in, like watches etc., while you wash. 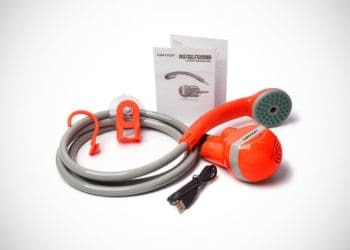 The next ingenious device we have is this portable electric shower from OnTrackGear. With a simple and elegantly compact design, we think it’s rather cool. Although it only holds around 1.2-gallons of water, it is still enough for a quick clean and thanks to the spray gun-trigger head, you have full control over the pressure of the water. You just need to switch it on and then use the handy pump to build the pressure up, then you’re ready to go. Powered by a rechargeable battery, it offers enough for 30 showers on a single charge. The thing we really love about this model is just how lightweight and small it is. This means it’ll fit in your campervan, RV or even car, without taking up too much space at all. 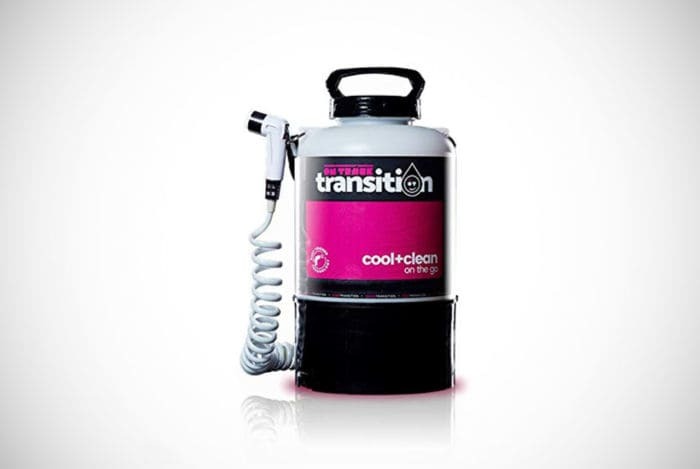 OnTrackGear have ensured that this has wide appeal thanks to their simple approach to the problem of washing on the go. We all like to see our money go as far as we can, don’t we? 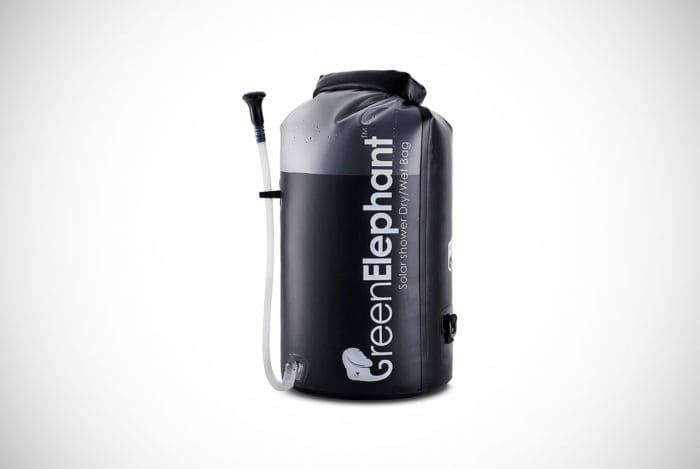 With this 2-in-1 dry bag and solar shower from Green Elephant, that’s exactly what you get. 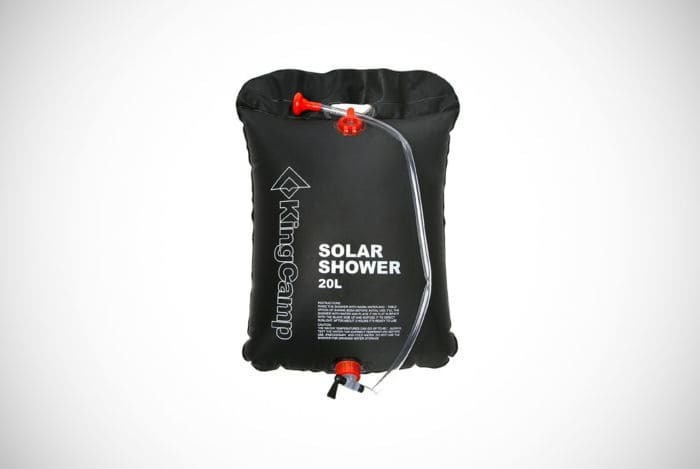 A portable shower that provides you with 5-gallons of water, warmed by the sun thanks to the solar paneling and a drybag when you need to keep clothing and other items dry in wet conditions. It’s been constructed from durable TPU, so will last a long time even with lots of use. 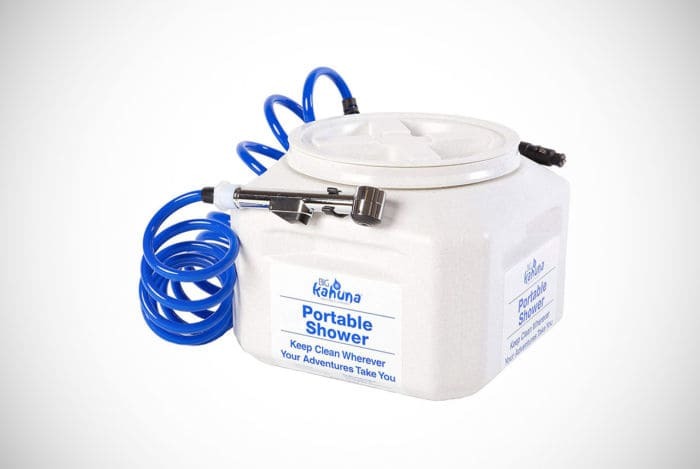 5-gallon is, as you’ve probably noticed, standard for portable showers. It gives you enough for two adult showers and as many as three for younger ones. Although simple, Green Elephant have done a sterling job of kitting it out with enough great features. Starting from the base up, it has a wide foundation that means you can stand it anywhere and it’ll stay upright. The PTU used throughout its design means its leakproof while being eco-friendly and free from toxics. The hose is very flexible and free of BPA, as it’s made from silicone. It’s also incredibly flexible and won’t kink easily. Everything in the design and construction of this portable shower has been done to provide a user-friendly experience that won’t disappoint. Another alternative to many of the other options we’ve featured is this great outdoor shower from Zodi. The Extreme differs because it’s durable stainless-steel water tank that also comes with a burner to heat up the water. Capable of producing 10,000-BTUs, the stove burner can warm the 3-gallons of water to 100-degrees Fahrenheit in just five to ten minutes. There’s a manual hand pump to the top of the tank that makes it relatively easy to pressurize the shower. Then when you come to use it you have a generous six-foot shower hose with shower head. We find this model particularly appealing. Not just because of its sturdy design, but because of its versatility. You see, because it comes with a separate burner, you don’t necessarily have to bring another burner for food. The burner can be used as a stove, so rather than just being a heated portable shower, it’s also a cooking appliance too. Bazinga! The ELECTRIFIRE portable solar shower bag follows a similar design to others we’ve featured already, so you know what to expect. It has a 5-gallon capacity water tank which provides enough for at least two adult showers and a possible three child showers. With non-toxic PVC you have the confidence that it will endure regular use in a variety of different environments, without causing damage to the planet. As with others, there’s a reinforced sturdy handle that makes it comfortable and easy to carry, even when full. The solar panel helps to warm the water up to at least 94-degree Fahrenheit over a short period of three-hours, meaning that you can enjoy a comforting and refreshing hot shower, no matter where you are. And isn’t that what you’re looking for from a portable shower? 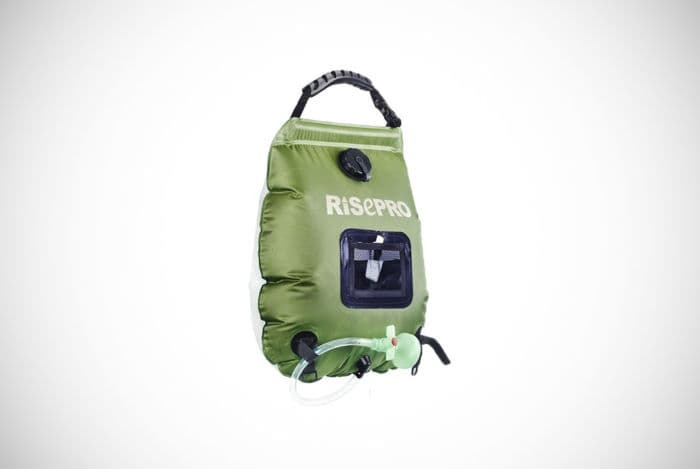 In addition to the standards, it benefits from a shower head that includes a switch to turn it on and off, convenient Velcro straps to keep the hose and all components compact and wrapped securely to the bag. The extra-large filling valve makes it easy to fill and there’s even a small pack bag that you can use to keep your soap and any other toiletries you need while showering, close to hand. Have you ever wished you could just take your own shower on the road with you when you’re camping or RVing? Although it’s not actually the same shower as the one in your home, the DEDC outdoor portable shower resembles a standard shower. 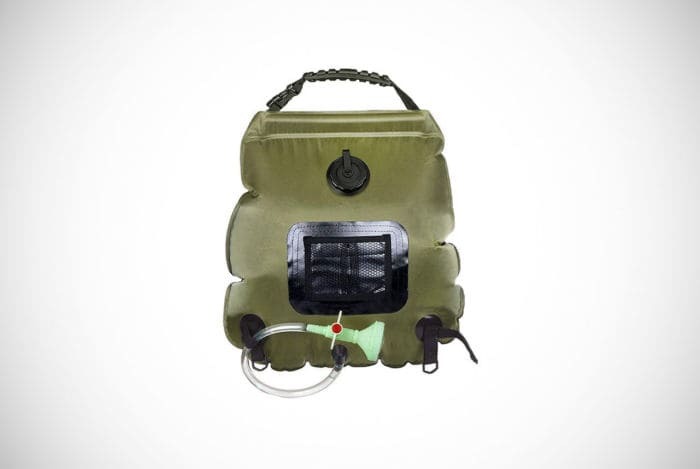 With this product though, you are not lumbered with a bag, there’s no battery pack or any tank – you simply get the hose, the pump and everything else you need, apart from the source of water, in one streamlined design. How does it work, you might be wondering? To heat the water, it connects conveniently into the 12-volt adaptor in your car (you know, the one you use for your satnav or smartphone). The shower has a 2-metre hose and a proper shower head, that is easy to adjust, so you can get the kind of spray and water pressure you prefer easily. 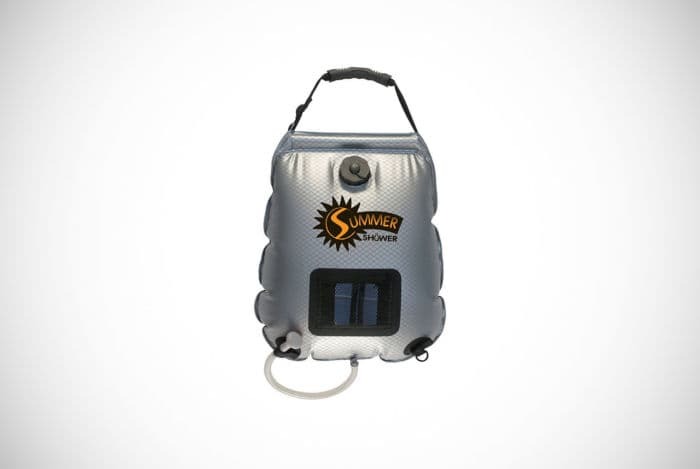 With an electric pump that you just slip into the water source of your choice and you are good to go. We like the real portability of this great shower and although there’s more powerful and sophisticated products on the market, with its low-ticket price, it’s rather awesome. It also comes with an s-hook that means you can use it like an actual shower for hands-free washing. 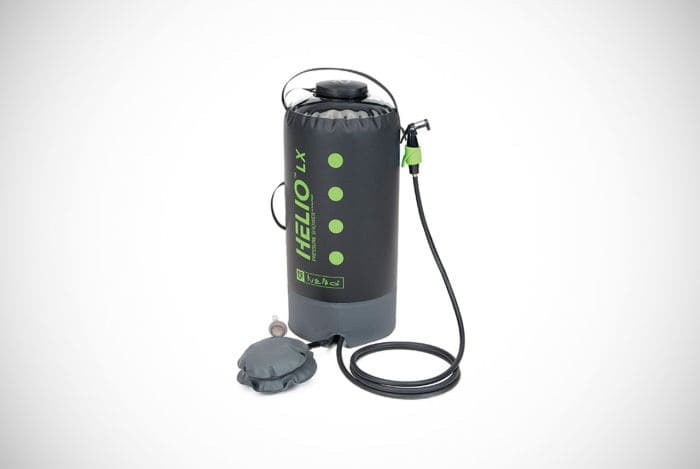 It may resemble a punchbag, but the Nemo Helio LX Portable Pressure shower is a great addition to your camping supplies. The punchbag resemblance may be very apt because with a tank that holds approximately 17-gallonsand the solar power design it provides you with around seven to ten minutes of pressurized sprayed water. The addition of a foot pump rather than the manual hand pump you often get makes this an incredibly effortless and easy shower to use. Did we mention that the actual hose measures at 10-feet in length? More than enough to hold up or clip somewhere high so that the whole experience is as easy as using that shower in your bathroom at home. Another great portable shower from OnTrackGear is the next item in our guide. This is not quite as fancy looking as the other, but still benefits from the basic, but adequate capacity of 1.2-gallons and has a five-foot hose. The difference is that it has a more compact design than the other model we highlighted. Similarly, to many it has an easy to use pumping mechanism that helps to build up the pressure to give you a nice spray of water when you need it most. What’s more is the fact that the shower head has been designed to get the maximum pressure while using water economically, so the 1.2-gallons lasts a lot longer than it might with a different portable shower. Now, if you’re the sort to get over-excited when you’re pumping things up, that’s not an issue as the OnTrackGear has built a spring-loaded relief valve into this shower to stop the tank from being over pressurized. Water sprays from the showerhead and there’s a short, but reasonably-sized hose for close use. While it may be one of the least sophisticated in our guide, we think for an affordable outdoor shower, you couldn’t go wrong with this device. Want to combine the best of both worlds? The best of Tony Stark and the future king of Asgard? Now you can with the Iron Hammer. Okay, so it doesn’t look at all like Mjolnir, it will keep you fresh and clean when you’re on the road or in the middle of nowhere. It’s powered by a 4800mAh lithium-ion rechargeable battery. This gives you enough power for up to an hour. It doesn’t heat the water but can use water between 5 and 50-degrees Celsius. There’s two power speed options – low and high. With the low speed option, it provides 3-litres of water a minute, while at high speed it produces 4-litres per minute. It may not seem like a lot, but that’s generally the idea. If space is something of a premium in your camper, RV or car it’s perfect. Particularly if want something to just keep yourself a little cleaner when you’re out there exploring, this is ideal. At Men’s Gear, we really love the portability and size of this shower. As well as the fact that it has been awarded an IPX7 waterproofing certificate. With a 70.86-inches hose and a shower head with the option to switch it on and off and a mesh storage bag. KingCamp is a manufacturer that has been officially operated on a global scale since 2004. Therefore, they have a good standing and fine reputation for designing and creating high-quality items to help make outdoor activities more enjoyable and comfortable. Products like this solar shower. For a ridiculously low price you get a very durable polyester construction that includes a tough and reliable handle that makes transport, carrying and hanging this shower bag easy. Filling it up is simple thanks to the large-sized valve with a twist-off cap. There’s a flexible hose and you can turn it on and off to really enjoy great showers like those you have back home. In addition to the handle, there’s also a hook and hanging rope measuring around 2-meters in length. To warm up the water you need to lay the bag out in direct sunlight for a few hours and then you will have warm water. To help you understand what the temperature is, there’s a thermometer. So, you never have to worry about scolding yourself, unless you those kinda showers that have a temperature like Mount Doom’s volcanic core in Mordor. The shower can be turned on easily by twisting the shower head one way or the other. 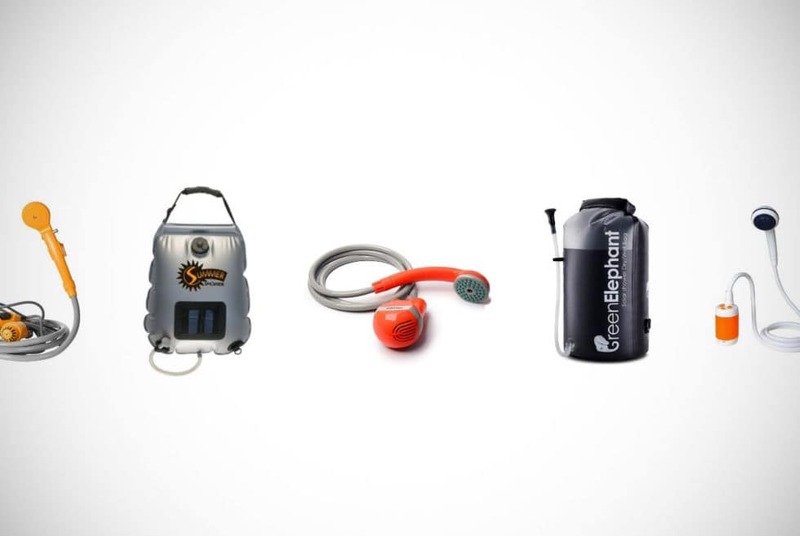 To round off or guide to the best portable showers, we’re leaving you with a real doozy! The Big Kahuna portable shower may just be one of the most appropriately named products we’ve ever had the pleasure of reviewing. Big Kahuna by name and by nature too. Especially when you consider there’s three different models to choose from – 4.7-gallon, 8-gallon and 13-gallon. There’s so much to love about this awesome portable shower, apart from that price, but we’ll get to that later. Let’s just consider the fact that you get a 12-volt submersible pump, by far the most portable in our guide that has a completely self-contained construction. It’s also incredibly easy to use. It’s got an 8-inch coiled hose that connects to the shower head. The shower head is something special because you have full control over the pressure, meaning you can make your shower as powerful or soft as you like. The water is warmed by solar energy and therefore, the lid has a panel that absorbs UV heat. So, we mentioned that this does come at quite a hefty investment. But really, you need to consider what you’re getting for the price. If you’re looking for the cheapest on the market, this certainly isn’t for you. However, if you’re prepared to spend a little out for something a bit better, then say hello to your brand-new friend. His name is The Big Kahuna and he doesn’t bite but will help you get clean! As there’s so many different types of portable showers and shower kits out there, it’s worth knowing what you need to look out for to know if you’re getting one that will suit your needs or not. Shower Weight – While most portable showers are lightweight, some will be heavier than others. If you’re trying to keep the weight of your camping supplies down as much as possible, you’ll want a model that doesn’t take up too much space or that is going to give you a severe arm workout to transport around. Be warned though, not all lightweight showers are as effective or produce the same amount of water pressure as the heavier models. Capacity – If applicable, you also need to consider the water capacity of portable showers you are looking at, as this will determine how much shower time you have. So, if you enjoy a nice luxurious, hot and long shower, you’ll need to invest in a portable shower with a large enough capacity to accommodate this. However, if you’re not worried about refilling it every little while and only like short, sharp burst-style showers in the morning, you’ll find that smaller capacities, such as 3 to 5-gallon showers are ideal. It’s important to note also that the larger capacity showers obviously are obviously heavier. Heated or unheated? – You’ll notice from our list that some of the portable showers we’ve featured heat up the water you store in them, whereas others don’t. One is not better than the other, not anyway. As it’s more down to a personal preference thing. If you don’t mind filling a shower tank with cold water and then leaving it for a few hours in the sun, then a solar-powered portable shower will suit your needs. If you’d prefer to use pre-heated water, either from your RV or a stopping point somewhere on your travels, then choose one that doesn’t warm the water. You’ll have to be careful not to fill it with water that has a temperature that exceeds the allowed level, but you’ll be able to enjoy showers quicker. You’ll probably have noticed that there’s a few different options when it comes to the types of showers available. Solar Portable Showers – the kind that warms the water stored in the shower tank using the sun’s rays. Very economical and environmentally-friendly. Non-solar Portable Showers – Often these will include just a simple tank and hose with a showerhead or spray gun. You would need to put warm water into these as they do not heat the water up for you. 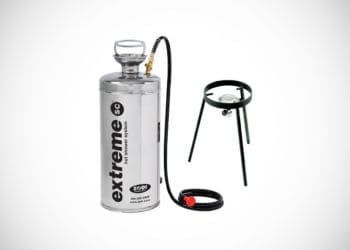 Pressurized Camping Showers – Another option you’ll come across is portable showers that are already pressurized and ready to use. These do not require a pump, whether its manual or electric. 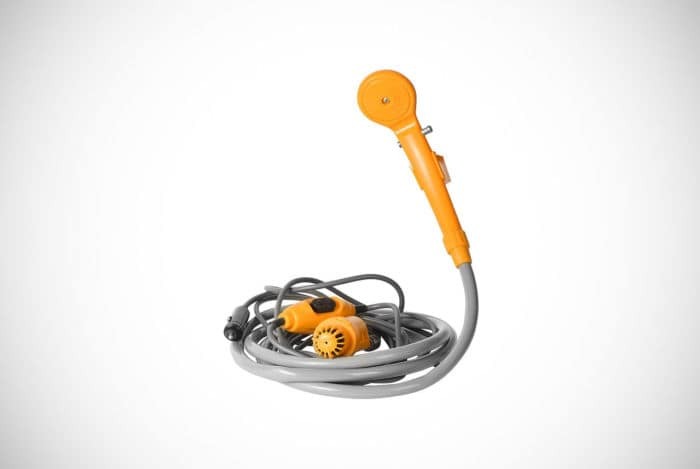 Hand or electric pump – Unlike the above, there’s also portable showers that require a bit of work to pressurize them. This is normally achieved either by an electrically-powered pump or with the use of a foot or hand pump. Again, we don’t really see either one as being better than the other, it’s more just down to personal taste and preference. However, as the price could vary depending on the type of model you choose, it’s worth giving some thought to it. 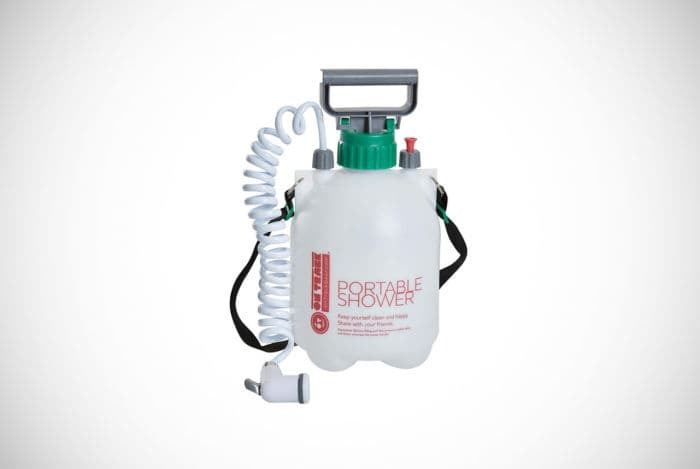 Convenience – it’s obviously very convenient when you’re out in the middle of nowhere on a camping trip, to just go over to your car or take from your bag a portable shower. Without one, you may have to consider the nearest lake, and that might mean a very cold shower. Failing that you’d have to find a service station or use the showers available at the campsite (normally at a premium). Cost – That leads us nicely onto the next major benefit – cost. Using a portable shower when you go camping can reduce the cost of your trip considerably. Campsites often provide showers at a premium and although this mighty not amount to much, it will if your trip is for an extended period. The other option you have is to find another establishment and again, you’d be expected to pay for the use of their showers. Having a portable shower costs, you nothing, well nothing apart from any running costs (that are normally low). Cleaner and fresher camping experience – Our guide started by highlighting the fact that many people have a problem with the lack of cleanliness involved in camping. With a portable camping shower, even if you can’t achieve the same level of cleanliness you’d have at home, you can still feel fresher and cleaner than you would out in the wilderness without one. Well that’s our pick of the finest portable showers available t the moment. If you’re looking to get out in mother nature and don’t want to look like Grizzly Adams, then you need one of the great gizmos featured above. We know we’ve given you quite a lot to think of, but trust us, you should have seen the list before we whittled it right down to the 15 bad-boys you’ve just looked through. Given that not everyone has the same budget or likes to spend as much on their camping gear as others, we’ve tried to include a variety of products at different prices. As we consider most above to be the best of the best, we’d argue that you could invest in any of them and get a reasonably good experience using them. However, we know what a fickle bunch you can be, which is why you’ll find those with battery-powered pumps, solar-paneling to heat the water and other technically ingenious features, but we’ve also included a few very stripped back and basic, but nonetheless, effective solutions. Although many of our team like to just get down and dirty camping, we know others don’t share that same passion. So, that’s why you have the list above to look through. In addition to this list, we know that you might further help deciding on the best for you, which is why you’ll find our handy and informative buyer’s guide and FAQ. With our reviews above and the guide below, we’re sure you’ll be able to find the right portable shower to improve your camping experience dramatically and never have to worry about looking and smelling like a hobo again. 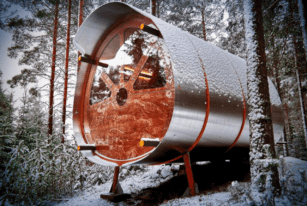 Barely larger than a cable car, Tree Tents’ Fuselage Wilderness Cabin is cozy, feature-packed, and easy to install. 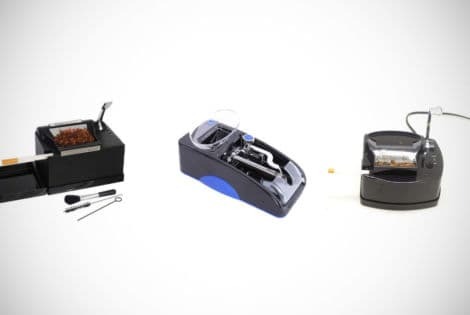 If you want to take advantage of the big potential savings by rolling your cigarettes, take a look at our guide to the best electric rollers available. Check out our ultimate rundown of the top 12 titanium wallets for men, the coolest new guy trend, and discover whether a metal wallet is the best choice for your wallet upgrade. 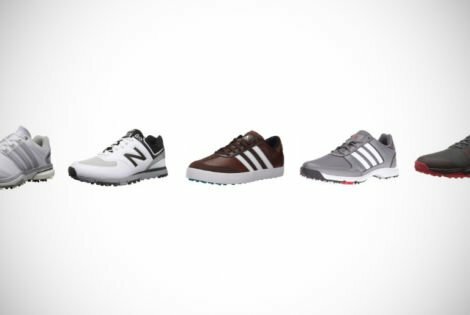 Discover your perfect pair of mens golf shoes with this list of the 20 best golf shoes for men. We've covered a range of styles, so there's no excuse not to take a peek.